Our model comprises two weeks of applied capacity building in data literacy using remote consultation. 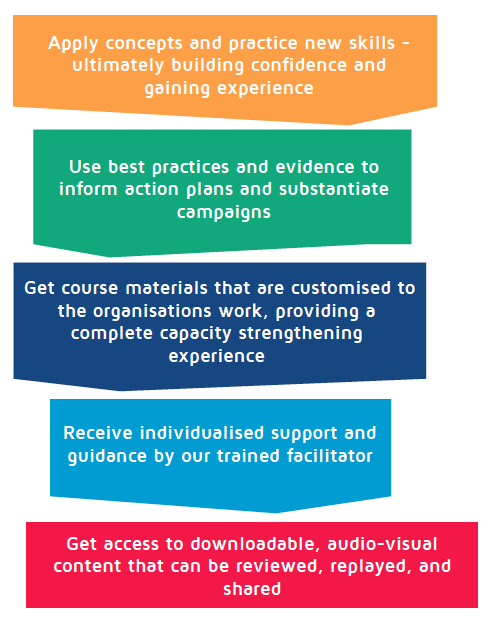 Many organisations need capacity building support in order to reach their goals. We have designed a number of different tools and approaches to engage them with data. Whether reached through in-person workshops, remote guidance through the materials, or intense two-day camps – the approach with the highest rates of success were those that built personal relationships with the CSOs and helped them engage with the materials in a personal way. The course is an online, experiential learning for evidence-based activism. We combine downloadable videos and templates with personalised support from a DataShift specialist. Through practical, actionable, and applied learning, we endeavor to change information into knowledge and data into empowering local narratives. Take a deep dive into the DataShift model. Citizen-generated data plays an important role in the data ecosystem of the data revolution. DataShift is interested in civil society being able to create and use their own data to set their communities’ agendas, monitor progress and hold decision makers to account. Here’s what our research tells us.